A provisional patent application, when prepared properly, is less expensive than a nonprovisional patent application, but not by much. A well-prepared, provisional patent application is not a cheap option. To understand the difference in costs between provisional and nonprovisional patent applications, one needs to know the similarities and differences of both types of application in addition to the effort each requires. Those similarities and differences are discussed here and are listed in Table 3 below. Both provisional and nonprovisional applications are similar in that they both establish a date of invention as well as provide patent pendency protection for the concepts, features, and information included in a nonprovisional patent application. Any information not included in the nonprovisional patent application is not patent pending. The primary difference is that the provisional patent application will be abandoned by operation of law (i.e., automatically discarded) twelve months after its filing date unless a corresponding nonprovisional application is filed. By contrast, a nonprovisional application automatically enters the queue for examination and is eventually assigned to an examiner to examine the application for patent. The nonprovisional patent application is only abandoned if the applicant fails to respond to an office action or explicitly abandons the patent application. Cost is a minor difference between provisional and nonprovisional patent applications. When prepared properly, the cost of a provisional patent application is about twenty percent less than the cost of a nonprovisional patent application. The price of a patent application includes fees for attorney time along with the costs associated with governmental filing and computer-generated drawings. Fees based on the time spent on the project by the attorney constitute most of the price for a patent application. The difference in cost of the two types of patent applications can therefore be best understood by enumerating the time devoted by an attorney to both. The “Background,” which describes the problem solved by the invention. 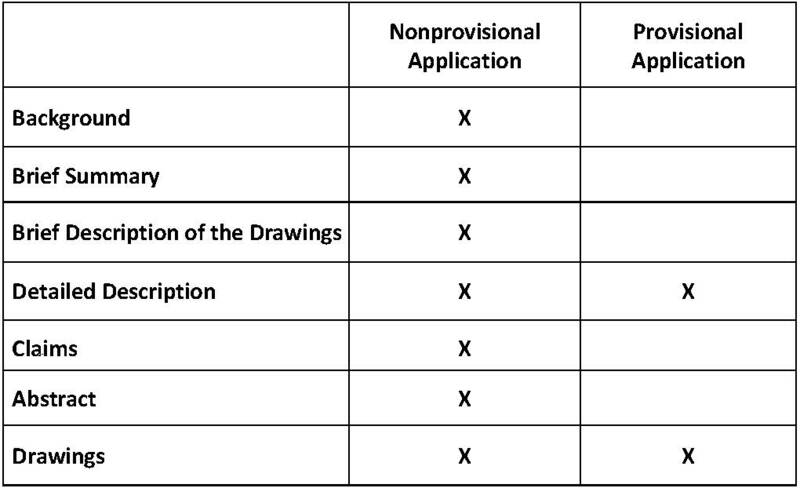 The sections required for both nonprovisional and provisional patent applications are marked with an “X” below in Table 3. Patent attorneys spend most of their time on the Detailed Description section when preparing a nonprovisional application. In the Detailed Description section, the invention should be described in detail including how to make and use the invention as well as any desired variants, options, or the “minimally competitive alternative product.”12 The Detailed Description should be crafted carefully to not limit the scope of protection afforded by the patent’s claims. The Detailed Description also forms the basis for the terms used in the claim language (see Chapter 10). Hence, eighty to ninety percent of my time preparing a nonprovisional application is spent on the Detailed Description. As the above chart indicates, only the Drawings and the Detailed Description are required to prepare and file a provisional application (other sections may be included, but they are not required). Since the Detailed Description, which is required in both types of applications, makes up the bulk of the cost associated with a nonprovisional patent application, the provisional patent application is made less costly only by excluding sections that are not required. The Background, Brief Summary, Brief Description of the Drawings, Detailed Description, Claims, Abstract and Drawings sections, are not required, are easy to prepare, and do not require a significant amount of time (note: the claims section does take more time than the others).13 I only spend about ten to twenty percent of my time on these other sections. Hence, the provisional patent application is not cheap and is only slightly less expensive due to fewer required sections. The Internet contains a lot of information about provisional patent applications, falsely describing them as “the poor man’s patent,” “a low- cost patent,” and “the cheap patent.” This is a mischaracterization of the provisional patent application. It would be better characterized as a lower-cost alternative to the nonprovisional patent application, as described by the USPTO. A low-priced provisional application may be of poor quality and ineffective for providing the type of patent protection the inventor wants and/or needs. Inventors can find a wide range of prices, as low as five hundred dollars, for provisional patent applications on the internet. Some of these prices cover only the filing of the provisional patent application and not its preparation. In this scenario, the inventor prepares the application and the patent agent or attorney verifies that the application forms are in order. The patent attorney does not normally review the actual substance of the patent application. At this cost a patent attorney may provide a minimal review of the Detailed Description, However, it most likely does not fully describe the invention or protect the inventor. A well-prepared patent application should disclose the invention’s point of novelty as well as other variants and options. For example, if part of the invention includes a screw fastener, the Detailed Description should likely include other types of fasteners including nails, latches, clips, etc. It should not describe only what the inventor invented, otherwise the description may be too narrow and the full scope of the invention may not be adequately protected by the patent. Even though the cost of such a patent application found on the internet is less, a low cost provisional patent application could cost the inventor more money overall since a patent attorney may need to mitigate any negative impacts later on. For example, if the way that the patent application describes the invention causes the claims to be narrowly construed or interpreted, third-party competitors may easily design around the patent’s claims. The inventor could not sue for damages and an injunction. If the patent application is not properly drafted to mitigate any narrowing interpretation of the claims, it may ultimately prove to be a waste of money. An improperly prepared patent application may prohibit an inventor from securing effective protection for an invention. Although patent attorneys are fallible, the quality will be better than if inventors draft patent applications themselves. I have reviewed many applications prepared by inventors and many are poorly written, do not address the proper points that need to be addressed, and fail to include essential information about the invention, such as the point of novelty. Often, if inventors choose to prepare a patent application without help, they reach out to a patent attorney only after encountering problems later. At that point, a patent attorney may require significant time to fix the issues. This will cost a significant amount of money to fix and meet the inventor’s end goals (such as receiving broad patent protection to sufficiently protect the product), if it is even possible. Utilizing competent patent counsel from the very beginning mitigates these issues. To be clear, I am not against using a provisional patent application to establish patent pendency. There are, in my opinion, strategies for utilizing the provisional patent application (see Chapters 4 and 7). If an inventor is going to expend the time and money to secure a patent or launch a business, the process of securing the patent should be done properly. Moreover, this process is not cheap despite claims found on the internet. If an inventor tries to cut corners, the costs of going through the patent process may be much higher than expected in the long run and not worthwhile. Hiring a competent patent attorney might require a higher, initial investment, but will likely save time and money with better results. 13. The Claims Section is a difficult and sometimes time-consuming to prepare and requires an experienced attorney to prepare competently. For example, a full Claim Set may include (1) claims directed to the apparatus and method of use and (2) claims directed to different entities that the inventor would like to stop should those competitors decide to make, use, offer for sale, sell, or import their invention into the United States. Drafting a Claims Set in a way that offers the optimal possible protection for the inventor is an incredibly nuanced process. The Claim Set may also have to take into consideration the business and marketing environment in addition to the invention itself. For more about the Claims, see Chapter 11.